What's in a name? After 36 years being known as the Sears Tower, the iconic Chicago structure was officially renamed the Willis Tower. From the building first named "Burj Dubai" to the former "Freedom Tower," name changes impact the collectability and economics of souvenir buildings. Burj Dubai became the Burj Khalifa during its grand opening events. Gift stores in the area, caught off guard by the new name, had to scramble to change or reproduce new souvenirs with the correct name. According to The National, "Shelves in stores in Karama, the souks and even official merchandise stands yesterday were still laden with goods bearing the Burj Dubai name. Traders said sales of trinkets featuring the world's tallest tower had noticeably dropped. Orders have been rushed through for large containers of souvenirs bearing the new name, Burj Khalifa, but as the merchandise is manufactured and shipped from China and Thailand, traders were expecting a wait of at least a month until they arrive." Muhammed Salahuden of Fields Birds Fashion in Karama said, "Once I put in a new order, it can take up to two months for it to arrive. 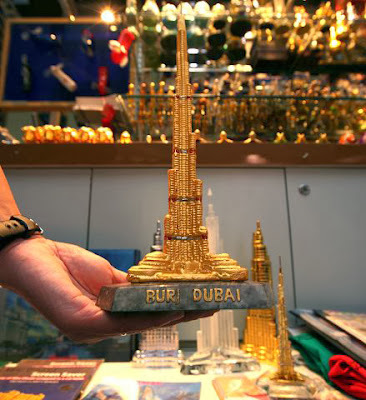 I want to get Burj Khalifa souvenirs but I will have to get rid of these first by making them cheaper or giving them as gifts." He said he was fortunate that "some people are not aware of the name change and I still managed to sell five crystal towers, but sales were a lot higher last week". The smallest Dh20 souvenir had been reduced to Dh15 while a larger Dh60 version had been slashed to Dh40. He said he is looking into the possibility of having the "Dubai" part of the name scratched off crystal souvenirs and re-etched with "Khalifa" at an engraving factory in Ajman. "It would save a lot of money if we could do that," he said. Benjamin Katana, who runs a stand in Dubai Mall called I Love UAE, said sales of gold-painted and crystal towers marked Burj Dubai had dropped by half from the previous week. "The most expensive is a gold one at Dh900 as it is studded with real crystals," he said, "and I'm not sure how quickly that will sell now. However, I did sell a smaller version of it for Dh450 yesterday." Before it was discovered to have an incorrect quote, The Martin Luther King, Jr. Memorial had miniature replicas of the monument for sale. Both the online and physical gift shops at the monument are no longer selling replica of the statue. They were pulled from shelves when the quote mistake was brought to light. For those who bought a replica early may now have an instantly rare replica. The skyscraper under construction now in lower-Manhattan site of the former World Trade Center was planned to be called, "Freedom Tower." Now, the building's official name is the same as its address - One World Trade Center. I've seen souvenir buildings with the Freedom Tower name already being produced. What will future souvenir models the new One World Trade Center have as their name?